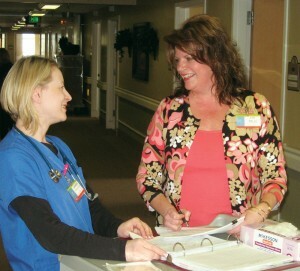 Kym Wells '91 and '92 (r) consults with a nurse at a Marquis facility in Portland. To strengthen his commitment to the partnership, earlier this year, Fogg established the Marquis Fund for Leadership in the Field of Long-Term Care in the College of Health and Human Sciences. “I appreciate the collaboration with Len Friedman — he takes our needs to heart, and it shows in the students he sends to us,” says Fogg.